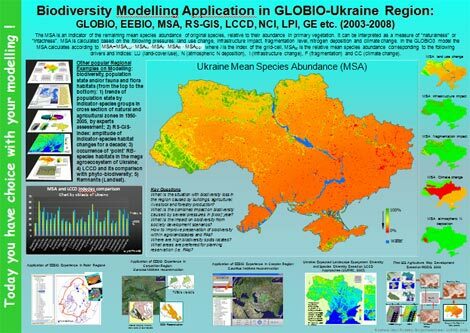 March 20-25, 2008: the Methodological Council of the Agrosphere Ecology and Ecological Control Department of the National Agricultural University (Kyiv) approved publication of new syllabus ‘Geographic Informational Technologies and Ecological Indications’ for biotechologiests. Several themes of it (##9,10,11 and 12) are about BIODIVERSITY modelling approaches i.e. GLOBIO and MSA specially! Visit “Landscape Ecology” book page.